Large bumblebee in coloured frame. Choose your own frame colour. 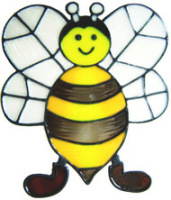 A more realistic rendition of a bumblebee in a coloured circular frame. Choose your own frame colour.